Brighton Ford : 10 Most Common Driving Mistakes. I’ve come up with a list of 10 driving mistakes that I am familiar with, in no particular order. By familiar with, I have either witnessed somebody else do them, or in many instances I am guilty of them myself. It is only natural to get a little sloppy having passed your test but how many from my list are you guilty of? 1. Forgetting which switch turns on the back wiper - I’ve been driving my car for months now and I still can’t remember which stick I need to pull or push to get the back wipers on. 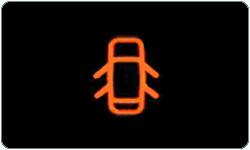 I usually end up putting one, if not both of the indicators on at some point, cue confusion for the car behind. I really wish I just had a button for it. 2. Forgetting you are still in gear when parking - An old habit of mine that I’ve thankfully grown out of. I’m not one of those people who ever leaves the car parked in gear so it was always done by mistake. The clutch would come out and the car would rock, dashboard lights would come on, I would look around hoping nobody saw but somebody always saw. Oh the shame! Remember - If you do have an accident, NEVER just drive away. That will only make things worse. 3. Having to remind yourself which way to give way to - Probably just applies to me again this time but on some days I have to remind myself to which side do I give way to. It sounds pretty awful but I assure you that I always remember in plenty of time despite not being engrained into my brain. 4. Trying to accelerate using the wrong gear - I’ve seen many people guilty of this one, common situation is that they’ve slowed down significantly for a roundabout and then forgot to lower their gear causing the car to shudder and choke as it slowly accelerates. Particularly uncomfortable if the gap you took was not the biggest but then again it is still better than trying to accelerate from a stationary position in 3rd gear and stalling completely (it was a friend who did that not me I swear). 5. Not closing the door properly - An unusual sound or a slight breeze in the car might lead to the first suspicions. If doubt rises the classic question of ‘are the doors shut properly’? will follow. Some may choose to pull over to assess the situation; the braver amongst us will just slow down, open the door and ram it shut, the braver still will merely ignore it and carry on driving. Often it will be the passengers fault, but as the driver, you are responsible for those in your car. 6. 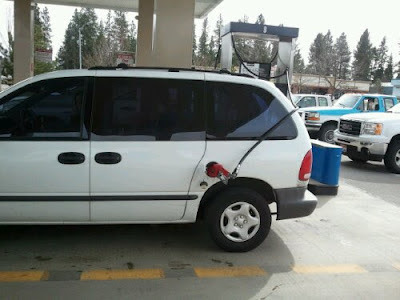 Thinking the fuel cap is on the other side – No matter how long you’ve had your car, sometimes you just can’t remember which side the fuel cap is, especially if you have more than one car. Some of you might be fortunate enough to have a passenger with you on the way to the petrol station of who can confirm the correct side. Lone drivers might just have to gamble and possibly face the awkwardness of trying to extend the pump across around the other side of the car. 7. Not being completely sure how to undo the fuel cap -Delight that you’ve managed to pick the appropriately sided petrol pump can soon be cut short by the realization that you aren’t sure how to undo the fuel cap. It’s a task that can take several minutes and if there is a long queue forming then pressure can mount. Fortunately, this is should only be an issue for infrequent drivers and/or the first couple of fills. 8. Forgetting to turn your lights on when it’s dark - In a well lit up area it can be easy to forget to turn your lights on, particularly when you jump in the car when it’s already dark. In my opinion, people turn their lights on way to early sometimes but when it’s 1am even I can recognize that my lights need to come on. People may flash you down the street, are they being friendly or are they angry? It sometimes takes you a while to realize that they are doing it because you’ve spent the last 20 minutes driving with no lights on. 9. Spending too much focus on profanities directed towards other drivers - It happens, people annoy you, other drivers chop you up, choose not to drive even though there is a huge gap or they drive far too slow. Putting too much effort into swearing at them and being too mad can lead to mistakes on the road. Whilst I can understand those of you who might like to stick two middle fingers up to some reckless drivers, you certainly cannot drive as well without any hands on the wheel. Put your Elton John CD in and calm down, there is no need to come down to their low level of driving etiquette. 10. Going the wrong way down a one way street - I haven’t done this myself due to a lack of one way streets where I live I imagine it must happen from time to time. I mean, in a new environment it must be quite easy not to notice a little sign saying no entry. I have committed a related crime though as I once wrongly believed that I was on a one way street when it was just a normal, two lane road (it turned out it was the street I turned into that was). Following the rules of a one way street I went in the right hand lane as I wanted to turn right but I was in fact simply on the wrong side of the road, thankfully nothing came my way though. Those of you with more adventurous bad habits such as doing flips over roundabouts and reversing down motorways then I do apologize that you might not be able to relate to this comparatively tame list. If this is indeed the case then I would love to hear any mistakes that you readers are guilty of, I’m sure there are a few that haven’t been included! If you have any questions about your vehicles features please feel free to contact us. We would be more than happy to help you avoid any of these mistakes.